May 24, 2012- By James Bruggers in the Louisville Courier Journal. Editors note-Valley Watch has been a party in several challenges of the new power unit at the Trimble location, including the waste disposal plan. U.S. Environmental Protection Agency officials are opposing a proposed wetlands-destruction permit for the Louisville Gas and Electric coal-burning waste landfill planned for Trimble County. 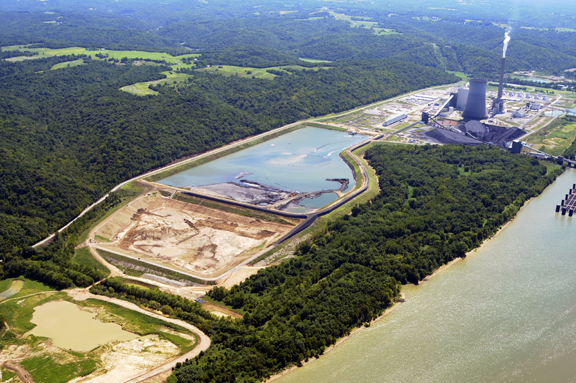 The opposition to the permit throws another hurdle in front of the power company’s plans to store nearly 1 million tons of ash and scrubber waste at its Trimble Generating Station along the Ohio River northeast of Louisville. LG&E still faces earlier concerns about a cave on its property that the Kentucky Division of Waste Management has said should be protected under a 1988 cave-protection law. A recent letter to the U.S. Army Corps of Engineers in Louisville from EPA officials in Atlanta said the landfill would damage as much as 10 miles of streams, 1.1 acres of wetlands and .27 acres of ponds within the watershed. “Information available to the EPA suggests that the aquatic resources proposed to be impacted as a result of this project may be among the highest quality headwaters stream resources in this region of the Commonwealth,” according to the letter. EPA officials said the power company failed to consider enough alternatives to its proposal and also has overestimated the amount of waste the company needs to store. Chris Whelan, a spokeswoman for LG&E, said the company intends to respond to federal officials about the EPA concerns. “I think the presence of a very high-quality stream and the questioning of the actual volume of disposal capacity needed may make permitting this site very difficult,” he said. With the plant’s ash storage ponds filling up and ash-pond safety now a national concern, LG&E has been planning on stockpiling its ash and scrubber waste in a new, presumably more environmentally friendly landfill to be built on 218 acres of company-owned property near the plant. If that plan is blocked, company officials have said they might have to haul the waste to its Mill Creek power plant landfill in Louisville. Reporter James Bruggers can be reached at (502) 582-4645. This entry was posted in Uncategorized and tagged CCW, Coal, Coal Ash, coal waste, Kentucky coal, LG&E. Bookmark the permalink.